Deciding that 'if' the world was coming to an end as 1999 rolled into 2000 I booked an island hopping voyage aboard STS Lord Nelson that crossed that threshold. Plus it HAD to be warmer than jolly old festive home! Arrived at the airport at 1130hrs, time to spare, to get my bearings. Sitting alone reading my book not really taking any notice of the world around me, when I spy a fella who sees me, eye contact is made and a brief smile is exchanged. He starts to walk over towards me, oh heck now what do I do. Standing infront of me he quickly unzips his coat exposing the most pleasurable sight beneath, a JST T Shirt. Thus I was introduced to Steve from Bristol, sitting near the check-in desk was a young lad in a wheelchair, Dougie who had just flown from Aberdeen. Slowly the number of JST clad or rucksack carrying people grew. Check-in was smooth and efficient and through to the Departure Lounge and the nearest bar, Weatherspoons, slowly a few more of this volunteer crew arrive, Nic and his buddy Jane, Adrian, Cyril and Jackie. Before too long it is off to find the Departure Gate, where we stand and wait for an hour. The wheelchair users were loaded onto the aircraft first, unfortunately with there being a large number of us (ten) it took a lot longer than anticipated and we missed several take-off slots. Eventually airborne 1648hrs. 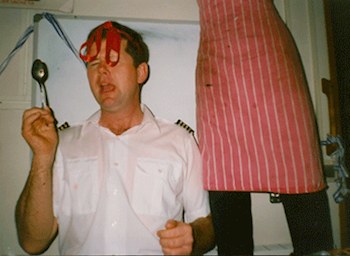 As per usual the in-flight meal was disgusting and the crew were scattered throughout the plane. We landed at Madrid 2015hrs. After the ‘walking’ passengers were dis-embarked, the remainder of us, affectionately known as the Wheelies, were transferred onto a hydraulic platform and driven directly to our connecting flight. As we avoided passport and customs we were technically illegal immigrants! The connecting flight had been on stand-by waiting for us and after we were all loaded and comfy, we sat for 30 minutes waiting for take-off at 2115hrs. Another disgusting in-flight meal and equally boring flight with the crew scattered, tried to get some sleep. Hauled on-board and make my way down to the Lower Deck and find my bunk, there I met Karen who was to be my buddy on the trip. She is a first time sailor and around my age, she is deaf in both ears and has to rely on a combination of hearing aids and lip reading, like me she is independently minded and works full-time as a Royal Mail sorting and some times delivering the mail. 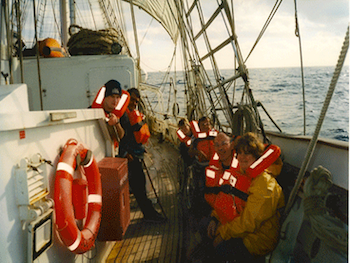 We draw our wet weather gear (optimists), safety harness and sign-on the Ship’s Articles as crew. Chris is our Watch Leader; he is from Huddersfield and works on the railways. My watch for this trip is the Forward Port. Sorted and finished the unpacking and we eventually fell into bed at 0150hrs not looking forward to waking up at 0730. A bit of a fretful nights sleep, it was hot and stuffy below but I did feel quite rested even though I had only had 5 hours sleep! Oh that first morning scramble for the heads, 40 people all trying to squeeze into spaces for 10, took the sensible course of action wash after food. Today we sat in our watch groups, a chance to meet and great and for our Watch leader to talk us through what is going to happen over the coming days. After all the breakfast things were stowed away, it was the briefing by the permanent crew. Piers, who I have sailed with before, has been promoted to Second Mate and has shaved his beard and cut his hair, I nearly did not recognise him and Jo is still Medical Purser. Captain for this voyage is George as John Fisher is now the Captain of the new ship Tenacious. Our plan of action is first of all the evacuation drill, whoop, it is a strange feeling to be pulled up a flight of stairs and not really feeling the wheelchair beneath you. Still the sunshine on deck is very pleasant, as we sit or stand there waiting for the okay to remove and pack the lifejackets away. Time for lunch, just as we had all finished stuffing our faces it was action stations for departure. Once on deck we can leave Las Palmas Gran Canaria, set ALL the sails, brace ALL the yards and head for the most westerly island La Palma, where we hope to arrive tomorrow lunch time to meet up with a few tall ships. Karen and I were easing the halyards for the four square sails and the outer jib. Suddenly all effort was halted as our first school of dolphins came to play about the bow. Neil commented that he had noticed that they come a lot closer when the engine is turned off. The deck was a tangle of various ropes, so as ever the last job is to make good, as I had sailed before I had to instruct Karen, Nicci and Paddy in the art of stowing the ropes on the pins. Time for afternoon smoko by the main mast and an afternoon free to enjoy the sun and the gentle roll of the sea. As we were on the dog watch from 1800hrs we had our dinner in the Upper Mess, lovely roast chicken, it should have been a paella but so many people objected to shellfish it was a sudden change (personally I would have enjoyed either). Once on the bridge I was straight away transferred to the helm chair, while Watch leader Chris explained to our novices what happens while on watch. My teachers hat was put on again to instruct Chris and Paddy how to helm and what to look for. 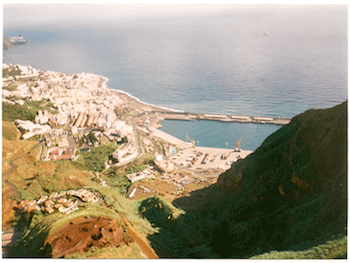 After which I was placed on the port lookout, where I watched Tenerife slowly pass by. The next watch were abit unorganised so it was 2020hrs before we were relieved. As it was Christmas Eve I went into the bar to join in the fun and laughter of strangers becoming friends. As I lay here in my bunk I can hear the carol singing going on in the bar (yes with the proper words), I can feel a tear forming in my eye so before I get too sentimental I will snuggle down to sleep, besides wake up call is 0620hrs as on early watch! I had a brilliant nights sleep, the gentle rocking was relaxing and soothing. I was awake before the wake up call, Karen and I were making our way to the Upper Mess by 0715hrs, took abit longer than usual as every time you saw some-one it was ‘Merry Christmas’ and the obligatory exchange of kisses. 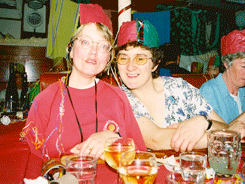 In the Upper Mess the CD was playing popular seasonal tunes, Caroline and Graham were wearing Santa hats. Breakfast was something special, Bucks Fizz with the toast and cereals followed by scrambled egg in smoked salmon. There was a jubilant atmosphere about the ship as we made our way to the Bridge. Strapped to the helm chair again, our officer of the watch was Neil the Bosun who kept altering course as the wind direction changed, so all in all I was kept quite busy. As we had to do another evacuation drill (it is mandatory that two are carried out) we were relieved from the bridge to have morning smoko in the Lower Mess. Smoko consisted of hot and cold drinks, more Bucks Fizz and Christmas cake, hand made from scratch and decorated by Graham, it looked beautiful. Smoko was over by 1030hrs and the speedy evacuation drill had us all on deck, lifejackets fitted and ready by 1042hrs, not bad. As we were all on deck and we were approaching La Palma we started to take in some of the sails (with 10 set that takes time). This involved some people going aloft to do the harbour stow on the course and top sails. We were still busy preparing to enter harbour by 1230hrs so lunch was a mountainous selection of sandwiches laid out by the Main mast, which you grabbed every time you went past. As we docked in Santa Cruz La Palma, the crew of the Sir Winston Churchill greeted us with carols and streamers. Barbara who was First Mate on my previous voyage is now the Captain on the SWC, it was lovely to talk to her again. 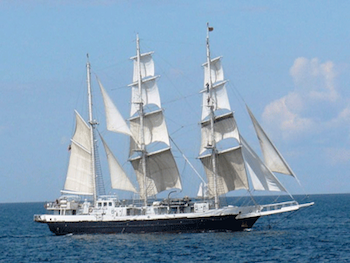 The Eendracht, Roald Amendsen and the Alex were also there. Shore leave was pronounced but we had to be back on board by 1730hrs in order to be seated for dinner. Karen and I set forth to explore the town of Santa Cruz. The Spaniards do not celebrate Christmas like we do, Easter is their big festival, so some shops were open and there was an arts and crafts street market. We found an absolutely fabulous crafts shop, I am so glad they do not do mail order! As we made our way along the seafront it was curious to see how rough the sea was, yet it did not feel like that when we were on our way in, at one point the waves were crashing against the sea wall and spraying over the road enough to drench the passing cars. As we meandered through the streets we kept seeing little clumps of the crew at the bars – how unusual. Back on board and ready for dinner as ordered and I can honestly say that if I had not seen it I would not have believed that you could fit fifty people into a space designed for thirty. The decorative sight that greeted us as we took our places at the tables bedecked with crackers, streamers, party poppers, flowers, bottles of sparkling Cava was almost as overwhelming as the five course meal we were about to devour. Seated at our tables, with the Cava flowing nicely awaiting the first course, we had to crack our crackers otherwise there would be no room for the plates. It was decreed by tradition that paper hats must be worn unless you possessed something sillier. To help with the spacing crisis Captain George placed a party popper in-between each finger and pulled the strings simultaneously, what a bang, what a cascade of streamers, what a mess! But seeing as he was one of those who would be clearing up it did not matter. 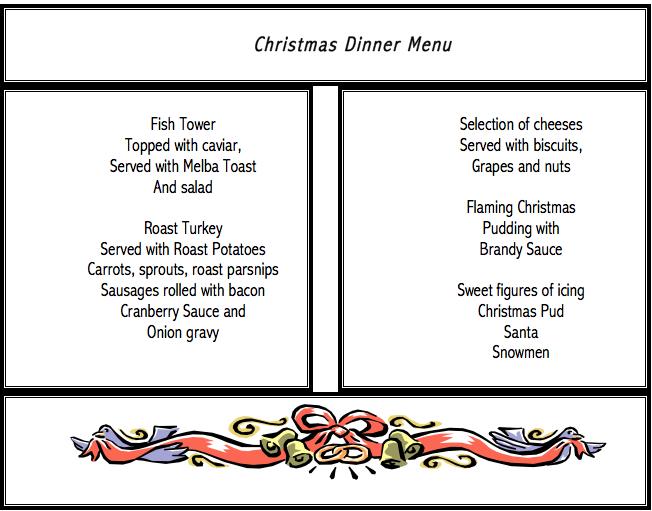 The PC’s served the meal and as we were so crowded, they could not use the dumb waiter (day off being Christmas and all that! ), everything had to be carried down by hand. The only way they could get to their tables was to go into the Upper Mess, climb down the companionway into Henry’s locker and through the focsile. After we had finished stuffing our faces and downing bottles of vino, while the permanent crew cleared away all the mess, us voyage crew sat there singing songs most of which were completely unrepeatable in polite company! We adjourned to the bar for coffee and brandy and incase we were hungry chocolate truffles, peppermints, nuts and fruit. A game of charades began with some pretty obscure titles and some equally baffling mimes, aided and abetted by alcohol and it was a pretty raucous affair. At 2000hrs a local salsa band started playing in the quayside marquis, trouble was nearly every tune sounded the same. Following the normal scheme of things we would have been on watch from 2000hrs but harbour watch does not start until 2200hrs, Daamon and Malcolm volunteered to do the 2200hrs to 0000hrs watch, so no watches for me, just time to party. Sorry but I am not going to admit what time I got to bed, that is an official secret! Everybody was up for breakfast together but only forty to sit in the Lower Mess. Today is an organised day, we had instruction to be on the quay at 0845hrs for the crew photo session – smile please, hide those excess hangovers and no sunglasses. Then the coach arrives to take us around the island. I was really impressed at the lift and locking mechanism the coach has for wheelchairs. Off we go seeing architecture, fig trees, banana plantations and a lot of very shiny new cars, as the island is so small there is not a lot for the population to spend their money on, so even manual workers have new cars and designer label clothes. The problem was that the coach was so cosy and the sun streaming through the windows was so comforting that most of us (me included) slept through the riveting commentary. We stopped at the usual panoramic photo point, which looked down on the harbour area from where we could see the tall ships. We visited the national park and walked the rough track through the ancient (very ancient) volcano crater and saw the world renound astrological observatories built at the highest point. 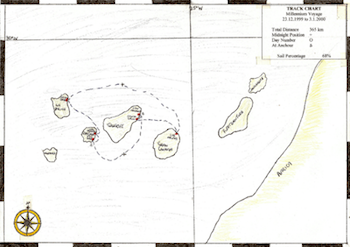 It was explained that the island has no rodents and very little wildlife. The walk back up the tracks was a lot more difficult than the walk down, ropes were put around the base of the wheelchairs and they were dragged up the tricky bits. Then off to lunch, a local restaurant prepared a feast, well it would have been if all the courses came together. First there was soup, then salad, then potatoes, then platters of meat and fish, finishing off with fruit pie, washed down with local wine. With there being 45 of us it took 2 hours for lunch to conclude. We all clamoured back onto the coach and got comfy and more sleep. Onto the Volcanic creator that is dormant rather than extinct, but fortunately wheelchairs could not get to it. As lunch had taken so long we did not get back to the ship until 1845hrs and my watch were all going ashore together at 1930hrs, just enough time to change and try and wake up. Off we all wondered into town, through the back streets to a lovely sheltered little bar where we ordered tapas and drinks. It was a good bonding session telling tales of embarrassing moments, thoughts and opinions, what we do when we are sane and at home. I think we were all feeling pretty exhausted after the past few days and we were back on board by 2245hrs, not much point in going to bed as Karen and I are on Harbour Watch from 0000hrs to 0200hrs. I got really cold during harbour watch despite the layers of clothes I was wearing, when we came down into the bar at 0200hrs Daamon and Dougie warmed my hands and I succumbed to a nip of brandy before bed. I had a bad time sleeping with the hot flushes and cold shivers and I had a headache growing, I asked Karen to fetch Jo, as I really did not feel right. She took my temperature which was very high, so gone was the cosy duvet, replaced by a sheet. The Doctor, Justine who looked far too young, checked me over and told me to drink plenty and take some paracetamol, and to stay there until my temperature was nearer normal. The rest of the day was spent dozing and sleeping in-between hot flushes and temperature checks, feeling that I had let my watch down. Consequently I hardly felt us leave La Palma and set off again.